The new Shimano 11-34T CS-HG700 cassette further expands gearing options for a wide variety of terrain. Featuring a versatile design, the CS-HG700 fits both MTB- and road-specific wheelsets, with the use of the included spacer. A wide 11-34t gear combination allows for any terrain to be tamed. Removable spacer for compatibility with MTB hub body. High performance rider tuned gearing. Fits a wide variety of drop handlebar road bikes. Uses 10 speed freehub width but comes with a spacer to fit 11 speed cassettes. If you have a compact and ride a lot of hills, this will get you a 11 ratio that will help you tackle any hill. I was having trouble converting my Lemond Revolution to an 11 speed cassette. Most options required machining either the freehub or the back of an 11 speed cassette. 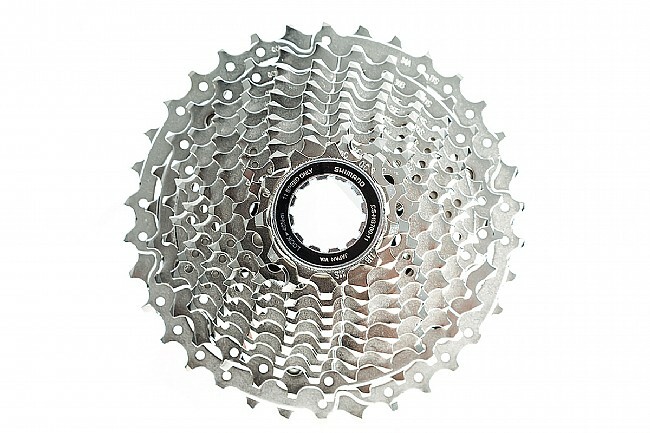 The Shimano 105 CS-HG700 11 speed cassette eliminated that need! This cassette is set up to use on either a 10 speed or 11 speed free hub! It was the perfect solution discovered by accident. I originally purchased it thinking I was going to have the back machined to make it work. I was very surpirised to find that it was made for either. This was perfect!